Stylish and contemporary aluminium pole system, looks like a pole but functions like a track. Made to your exact length and fitting requirements, 15 exciting colours. Manufactured to the highest standards of quality associated to the brand Silent Gliss, the Metropole is made from aluminium and is available in a large selection of modern colours to perfectly suit all styles of interior décor. The pole has a diameter of 30mm (1 3/16") and is suitable for hanging medium to heavy weight curtains of up to 10kg. Simply enter your required pole length and choose between wall or ceiling fixing brackets and your Metropole will be delivered to your door within 5 working days, with FREE delivery. Poles can still be cut to length at home if required. Poles are supplied in 1 piece in lengths of up to 595cm (234 1/4"), other than the chrome colour which is supplied in 1 piece in lengths of up to 400cm (157 1/2"). Multiple poles can be joined together by purchasing the Silent Gliss Metropole 6635 internal connection bridge – see the ‘related items’ below. Please note – the gliders will not pass over the join between poles. Below are the measurements of the pole profile as well as the wall fixing and ceiling fixing brackets which are both supplied in the same colour as the poles. The wall fixing brackets allow you to fix the pole anywhere between 32mm (1 1/4") to 51mm (2") (from the wall to the centre of the pole measurement). All brackets include a magnetic cap to hide the fixing screws. Please note - fixing screws and wall plugs are not included. We recommend acquiring the correct screws and plugs for the surface that you are fixing to. How many gliders are supplied per length? 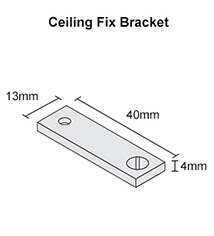 How many brackets are supplied per length? Strong and stylish aluminium curtain pole that operates like a curtain track. Made to measure to your exact length and fitting requirements. Hand operated (no cording) and suitable for medium to heavy weight curtains of up to 10kg. Poles are all supplied in 1 piece lengths of up to 595cm (234 1/4"), multiple poles can be joined together for longer lengths. Can not be bent at home. Can be cut down to length at home if still required. 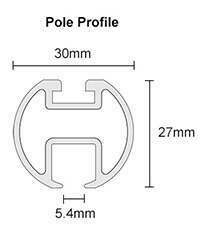 23mm (7/8") and 50mm (2") diameter versions of the Metropole are available – see the ‘related items’ below. 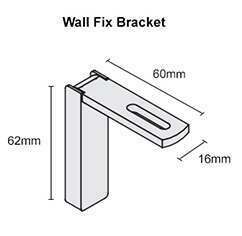 Extra and alternative brackets, gliders and a connection bridge are available to purchase separately – see the ‘related items’ below. This product is a made to measure product (made to measure goods) and therefore cant be canceled, refunded and is non returnable, by ticking the "I understand this is a made to measure product *" this is confirmation you understand our terms and conditions. See our Terms & Conditions.